Techniques of Molecular Modelling: Molecular Mechanics. As noted before, the origins of the molecular mechanics method can be traced to work done by eg Barton (see reprints on van der Waals, electrostatic or the joined up analysis), Bright-Wilson (Molecular Vibrations, 1938. DOI: 10.1063/1.1750232) and others in the late 1940s and early 1950s and e.g. Allinger (starting in 1959, DOI: 10.1021/ja01530a049) and the MM2/3/4 force fields and Kollman/Amber in the 1970s-80s. Steric energy normalised relative to zero rather than any thermodynamic quantity. The parameters in the above equations require definition of the atom types (hybridisation of each atom; carbon has perhaps six different useful hybridisations) and an explicit definition of where one thinks the bonds are and of what type (single, double, delocalised etc). For bond lengths (1st term), each parameter (force constant K) is specific to the particular atom-type pair. A great many different atom-type pairwise combinations are possible from the elements of the periodic table; few force fields have even a fraction of these permutations. A force constant K is also needed for each three-atom bend combination. For the torsional 3rd term, parameters are inserted only for the common single and double bonds. The second part of this term accounts for the dispersion energy. There are also a rather simpler so-called universal or full periodic table force field (UFF, DOI: 10.1021/ja00051a040) where an attempt is made to interpolate atom pair or atom triple values from the basic hybridization specified for each atom, and specific values for each atom. These are not very good for energies, but suffice for cleaning up a crudely drawn structure. They can also be applied to many more elements of the periodic table than the MM2/3/4 style force fields. Some mechanics implementations insert cross-terms, ie stretch-bend. This implies that say a bond far from its equilibrium length may bend differently from one of normal length. One could also envisage a need for e.g changing the atom charges on say a polar carbonyl group as a function of its stretched bond length (this is never in practice done). There are an enormous number of potential cross terms, the vast majority of which are in fact neglected. For large molecules (say DNA) this may in fact be a significant error. As an approximate rule of thumb, the first three terms in the above equation tend to zero for unstrained and unhindered molecules. A high positive value of the steric energy is therefore taken as an indication of instability. The fourth term can take on negative values, particularly if the molecule is globular (lots of non-bonded attractive terms) or if the molecule has many ionic interactions where qi and qj have opposite signs. Force field parameters can be of widely differing quality. Some are derived from accurate experimental measurements, others may be pure guesses, or interpolations. Some force fields are good for energies, others for geometries. A good summary of the more widely used force fields can be found here. Energies should only ever be compared for isomers with the same total number of atom/bond types, in other words using the same parameters. Energies should not be compared across different force fields, across different programs implementing ostensibly the same force field, or even across different versions of the same program! steepest descent, which sets the diagonal terms to 1, and all the others to zero. Very fast, particularly initially, and suitable for the largest molecules since no matrix inversion need be performed. conjugate gradient, which evaluates the value of only the diagonal terms, setting all the others to zero. Slower, but meanders less when the gradient is no longer "steep". BFGS, which evaluates the diagonal terms, and approximates the off-diagonal terms from the history of the optimisation. Much slower, and less suitable for large molecules, since inverting the Hessian is now increasingly time consuming. Newton-Raphson, which evaluates all the terms. Extremely slow, but can succeed when all other methods fail (opt(calcall) keyword in Gaussian!). The value of Δx is obtained from a one-dimensional line search to obtain a scaling factor (normally around 0.25), and an iterative process started. Convergence is achieved when either the value of Δx reaches a small predetermined value, or the change in energy between successive cycles becomes small. Mechanics is good for conformational exploration (Monte-Carlo, Genetic algorithms, etc) where the number of possible conformations can number millions. It is used in this context for NMR predictions of molecules where many possible conformations may exist. 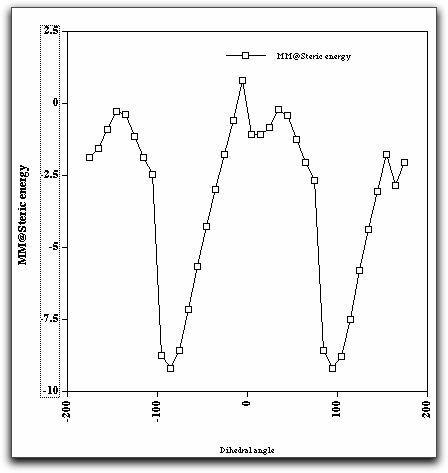 Mechanics is highly applicable to molecular dynamics, and hence derived statistical thermodynamic quantities such as free energies etc. In this context it is frequently used for analysing proteins, and other large biomolecules. Cannot be used for bond-breaking transition states and hence reactions. Organic chemists are taught that carbonium ion stability is predominantly due to electronic factors such as whether they are primary, secondary, tertiary, allylic, benzylic etc. What is mentioned much less is that their relative stability is also very sensitive to their geometries, and in particular the angles of the three substituents at the carbon. Geometries of carbonium ions are particularly inaccessible; it is not easy at all to get crystal structures! So how can Molecular Mechanics model the following carbonium ions? They are arranged in the expected order of increasing stability. Notice that the MM2 method gradually decreases the predicted angle energies. Notice also however how it predicts that the tertiary carbonium ion is actually LESS stable than the preceeding primary ion, which is surprising to say the least. Clearly, electronic factors must be playing an important role as well. Suffice to say that even without ANY consideration of electronic factors, the MM2 method does not do too badly in its prediction of relative stabilities. This re-enforces the conclusion that bond angles in carbonium ions are just as important as substitution! See also DOI: 10.1021/ed800058c for more detail. Energy of the final structure is 27.342 kcal/mol. Energy of the final structure is 28.788 kcal/mol. Energy of the final structure is 18.559 kcal/mol. Energy of the final structure is 15.017 kcal/mol. The H-bond energy functions in the Mechanics method are normally specifically parameterised against standard models, which involve three atoms, ie X...H...Y. The model of hydrogen bonding in this molecule is unusual to say the least, since it involves a whole ring and not a single atom as the H acceptor, and hence the Mechanics method (in theory) has no functional form which can reproduce it. In particular, aromatic rings are attractive to electrophiles by virtue of their quadrupole moment, which is a higher order property of the charge distribution (thus the so-called multipole expansion goes as monopole charge, dipole, quadrupole, octapole and hexadecapole. The equations above in effect only include the first and possibly second term of this expansion). The optimised geometry does predict what looks like H-bonding, but its directionality is not quite correct. The steric energy is -49 compared with -18 if the two components are infinitely separated. This makes the binding energy = -31 kcal/mol. In this case, it is predicted to arise almost entirely from the non-bonded van der Waals term rather than electrostatic or hydrogen bonding (dipole-dipole) terms. implies that if entropy decreases (i.e. ΔS is -ve) as a result of a reaction (or in this case a binding, in which two free molecules are reduced to one bound complex), then ΔG must increase (two -ve signs = a positive result) as a result by the amount T.ΔS. The Mechanics method could in principle provide an estimate of this term via calculation of the normal modes of vibration (and solution of the appropriate partition function equations), but few Mechanics programs actually perform this calculation (which requires the second derivatives to be evaluated, something only available using MM4, accurate to between 25-50 cm-1). An approximate estimate of T.ΔS is about -(12-15) kcal/mol at 298K (i.e. approx 2 kcal/mol per degree of lost freedom), which has to be added (-/- = +) to the binding energy obtained above, to obtain a final value of -(15) kcal/mol. This value is certainly in the correct ballpark. Another property of this molecule can also be studied using molecular mechanics, namely the rotation and preferred orientation of the aryl-C bond, for which mechanics is very well suited. The following "dihedral driving" calculation shows the MM2 energy as a function of the dihedral angle between the trifluoromethyl group and the anthracene ring. The barrier (about 10-11 kcal/mol) compares reasonably well with the measured value of ΔG (from NMR lineshape analysis) of about 14 kcal/mol. The discrepancy may well be due to ignoring solvation of the OH group, which increases its size, and hence the barrier. Now that we have a quantitative method for estimating energies of molecules, we can tackle a problem such as shown below. An application of "shape design" is the recent area of designing catalysts to promote reactions by ensnaring them in a cavity, or binding pocket. Whilst designing enzymes to do this is somewhat beyond the scope of the current course, a simple example of small molecule design can be shown here. A resorcinol-anthracene based aromatic molecule was designed in the form of spacers (the aromatic rings) and links (in the form of hydrogen-bonds) to create in the solid state a system with well defined cavities, which are large enough to accommodate small organic molecules, such as ethyl methacrylate and cyclohexadiene. The former is held within the cage by further hydrogen bonds to the cavity lattice. In particular, various changes to the structure can be made, to increase or decrease steric bulk, etc and the effects of these changes can be modelled, ie predicted. The previous systems were modelled by drawing/creating the model using the built-in editor (ChemBio3D, etc). Here we will be importing the X-ray derived coordinates. There are some important considerations to doing so. Applying the Mechanics model requires explicit assignment of force constants for ALL atom types, which in turn requires the hybridisation (sp, sp2, sp3) of all centres to be fully known. No intermediate hybridisations are allowed. Conversion from X-ray coordinates to a format where all atom and bond types are fully defined (e.g. the MDL Molfile) is not 100% reliable. In particular, the hybridisation must be deduced from a combination of the bond lengths of all substituents at a given atom, the total coordination, and probably the angles (ie sp2 assumes the central atom is coplanar with three surrounding atoms). the small organic molecules trapped in the cavity were actually "disordered" in the X-ray structure. This means that even the H count on any given carbon atom has to be carefully checked. In this example, all H-bonds were in fact "conventional" and hence the H-bond term in the Mechanics force field can be automatically applied. We will see in the Quantum Mechanics section how all these limitations can be removed. These energies are NOT corrected for entropy (i.e. they are closer (but not quite) enthalpic, and not free energies) a significant limitation. Very likely this sort of catalyst functions by converting enthalpic energies (the binding of the catalyst components) into entropic energies (i.e. pre-organising the reactants in the cavity, which of course consumes entropy. The free energy cost of assembling the three substrates is likely to be around +24-30 kcal/mol, but this is still likely to result in a win!). What IS useful with the mechanics approach is the ability now to make minor variations to the environment, such as changing the nature of the substrates included in the centre of the anvil to see how the binding energy responds. Its a tuning procedure! Just as with the anvil, the tennis ball is held together with hydrogen bonds, and this can be modelled using the Mechanics method, as can the organisation of the ligands inside the cavity. Here, the energy liberated upon dimerisation is 62 kcal/mol, of which 41 is due to the non-bonded dispersion terms and 21 to hydrogen bonds. This is more than enough to overcome the entropic terms which acrue when substrates are trapped inside. (c) H. S. Rzepa 1998-2013. No reproduction rights granted to this material without permission.